Two months ago a global donor conference pledged £21bn to help Iraq rebuild after the war against Islamic State (IS). Turkey was one of the biggest donors - odd, because its troops are still on Iraqi soil, which at least one leading Iraqi official has characterised as an “invasion”. Much more than this will be needed to reconstruct parts of Iraq after the months-long US-led aerial bombardment against IS. The UN says bombs will continue for a decade to come to litter Mosul, where 10,000 people were killed in the latest phase of the war. Only 10% of health facilities in Nineveh governorate are functioning at full capacity. Yet none of the worst war-ravaged areas expect to see any of the promised money soon. Iraq is rated the tenth most corrupt country in the world. The US was not at the conference and will not pledge a cent. This is despite the fact that it has visited unprecedented destruction on Iraq in recent years. First, the debilitating sanctions imposed on the country after the 1991 Gulf War. Then the 2003 invasion, which caused over two million deaths, both directly and as a result of side-effects from the damage to infrastructure and the environment. It created five million refugees, a million people with disabilities and half a million orphans. In Falluja, the US massacred “on a scale greater than any known act of barbarity by Saddam Hussein's regime in its final twelve years,” to quote from Glen Rangwala’s article in Labour Briefing at the time. It also used banned weapons against civilians whose toxic effects are reflected in birth defects that may continue for generations to come. A recent survey in the city showed a fourfold increase in all cancers and a twelve-fold increase in cancer in under-14 year olds. Beyond the loss of human life, there was the cultural destruction. The US used ancient historic archaeological sites as military bases, such as Babylon where 300,000 square metres of the site were flattened - including 2,600 year old paving stones, by US tanks. One million books, 10 million documents and 14,000 archaeological artifacts have been lost in the U.S.-led invasion and occupation of Iraq – the biggest cultural disaster, say some, since the descendants of Genghis Khan destroyed Baghdad in 1258. To this should be added the impact on education: about 500 academics were killed just from the Universities of Baghdad and Basra alone. The latest phase of the war was entirely as product of the US invasion and militarization of the country. It is now widely understood that IS began its existence in the US’s torture centres, most notably Abu Ghraib, where Iraqi detainees were systematically sexually assaulted and brutalised. Three years ago, IS was able to take over Mosul and other swathes of the country with barely a shot being fired, thanks to the flabbergastingly corrupt Iraqi army fleeing in the face of their advance. As it fled, it abandoned to the enemy huge amounts of US-donated military equipment. This included 2,300 armoured vehicles - a majority of all the armoured vehicles the US had delivered to Iraq - which made the subsequent war against IS all the more protracted. That war is now largely over. Once again, a terrible price was paid in the Iraqi loss of life. Meanwhile, |NATO troops remain in the country, despite the opposition of Iraq’s Parliament. And victors’ ‘justice’ ensures there is unlikely to be a lasting peace. Amnesty International report that Iraqi women suspected of family links to Islamic State extremists are facing a campaign of sexual violence and exploitation in displacement camps inside the country. Iraqi courts have sentenced 212 people to death in Mosul and surrounding areas, most of them for complicity with Islamic State. In one ten minute trial, a 42-year-old housewife had two minutes to defend herself against charges of supporting the Islamic State, before she was sentenced to death by hanging. All this is likely to lead to a strong sense of injustice and renewed conflict in the future. And this is why we continue to produce a fortnightly e-newsletter on Iraq, which has now run to over 350 issues. Fifteen years on, what lessons do we draw? 1. Removing Saddam Hussein was just a by-product of another objective: dismantling the Iraqi state and its institutions. This can be achieved in a many ways. It Iraq one of the most effective was the sectarianisation of politics. From the outset, the Governing Council, established in July 2003, had the names of its members each followed by their sect and ethnicity. This institutionalization of an ethno-sectarian quota system was toxic, allowed the US and its allies to pursue a ‘divide and rule‘ strategy and even threaten the dismemberment of Iraq. 2. The regional impact has been destabilising. The creation of Islamic State, straddling the border with Syria has created new dimensions to the conflict in that country. The chronic weakening of the Iraqi state has allowed Turkey to encroach into Iraq to pursue its relentless war against the Kurds. 4. In the UK: It discredited Tony Blair. It discredited New Labour. As a lifelong member of the Labour Party I take no pleasure from the fact that the considerable achievements of the Labour governments of 1997 to 2010 are entirely overshadowed by this monumental betrayal of everything decent democratic socialists stand for. The Iraq war fatally discredited Labour in Scotland and fuelled demands for Scottish independence. It polarised. It also made the public and MPs extra-cautious about rushing to war ever again on a false prospectus. Its delayed impact was to produce the vote against military action in Syria in 2013. This disconnect between public and politicians is part of the reason why, in the eyes of former UN Ambassador Jeremy Greenstock, British people voted for Brexit - people felt their views were not taken into account by those in power. Ironically in that campaign too, misinformation and derision of experts dominated. The 2017 election manifesto, about which I have recently edited a book, (http://www.orbooks.com/catalog/for-the-many-preparing-labour-for-power/), makes one reference to the Iraq war but it’s a significant one. It says the lessons of the Chilcot Report - nine years in the making - should be learned. This is more than what is in the manifestos of the Conservatives and Liberal Democrats, which is nothing. For them Iraq is forgotten. But amnesia is the privilege of the powerful. The dispossessed of Iraq are not so lucky. The war has abated for now. Things are returning to normal. which means: Iraq has resumed paying Kuwait compensation for the destruction of Kuwaiti oil fields and facilities during the 1990-91 Gulf War. But for Iraq, no compensation, no reparations. Fifteen years on, Iraqis are still a long way from getting any kind of justice, or compensation or reparations, let alone seeing anybody prosecuted for the terrible crimes committed against their country. Sadly, no major force in the anti-war movement seems inclined even to commemorate the anniversary of the destruction unleashed by western forces. As in previous years, it falls to Tadhamun, this small but dedicated organisation of activists, to mark the occasion. We in the anti-war movement salute the work you do to keep the crimes against Iraq alive in our collective memory, so that we do not forget, we do not “move on” and we never forgive the politicians that perpetrated this colossal evil. There may be a long wait, but there will be a reckoning - there will be justice for Iraq. Around 3 million people are internally displaced, almost half of whom are children, often with no access to education or healthcare. Capitalising on media silence, European statesand the US have started to reject asylum claims by Iraqi claimants and deport individuals at serious risk back to a combat zone many of them are actively engaged in. Denis Halliday, United Nations Humanitarian Coordinator in Iraq in 1997-1998, provided important background on how the UN’s failure to protect the Iraqi people in 1991 paved the way for the 2003 occupation. He called the economic and social sanctions theUN imposed on Iraq in 1990, following the invasion of Kuwait, a crime against humanity leading to the “shock and awe” campaign in 2003. Halliday, who resigned from the UN in protest, stated that the UN Security Council is corrupted by greed and vested interests in warfare, choosing warfare over diplomacy in 1991. The UN did nothing to condemn or stop the use of depleted uranium (DU) in Iraq in 1991, and instead unleashed its own violence through further sanctions, leading Iraq to accept the Oil-for-Food programme in 1995, funded entirely by oil revenues. The funds were inadequate and sanctions killed over half a million Iraqi children by 1995 due to a lack of healthcare and adequate nutrition. The use of DU, used again after 2003, led to ahuge increase in different types of cancer. Ayca Çubukçu, associate professor of human rights at the London School of Economics then spoke about the World Tribunal on Iraq which took place in Istanbul in June 2005. 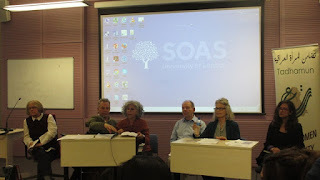 Modelled on Bertrand Russell’s Vietnam War Crimes Tribunal, activists at the World Social Forum decided to capitalise on the largest anti-war mobilisation since Vietnam to document war crimes so that they are not forgotten. Over two years, a network of global tribunals came together in Istanbul, led by Prof Richard Falk. It heard testimonies for 3 days and produced a declaration. Since then, the issue of what is to be done next remains. She hoped that Iraq Solidarity Month can help revive international solidarity with the Iraqi people. Remembering Iraq is not only important to the millions of victims who deserve justice, it is necessary - to reclaim the basic principles of peace and respect between nations that is the foundation of our shared humanity and guarantee we can all live in a future devoid of the scourge of war. It will be a reminder of the crimes committed in dismantling a state, society and culture so that they are not repeated. It is also a celebration of Iraq's history, resistance and aspiration for peace based on equality and justice. Victoria Brittan: Journalist and author of several books and plays about the war on terror and Guantánamo Bay. Haifa Zangana: Iraqi Author - journalist. .
Lowkey: British - Iraqi rapper and activist. The battle involving Iraqi and US-led coalition forces against the Islamic State (ISIS) in west Mosul’s Old City poses a considerable threat to civilians and civilian objects, international humanitarian and human rights organizations said today. All warring parties should cease using explosive weapons with wide area effects and inherently indiscriminate weapons in densely populated west Mosul. ISIS’s unlawful use of civilians as “human shields” and the difficulty of identifying civilians in buildings increases the risk of civilian casualties. "More than 12,000 munitions were used by the US-led Coalition at Mosul between March and May alone, according to official data - comprising airstrikes, rocket and artillery salvos, mortar attacks and helicopter actions. In addition, thousands more munitions were released by Iraqi air and ground forces - at times with little apparent discrimination. This despite the city still containing hundreds of thousands of trapped civilians," says Airwars Director Chris Woods. "The result of this ferocious bombardment on a densely populated city has been inevitable - with thousands of Moslawis reported killed in Coalition, Iraqi government and ISIS actions. Determining responsibility is proving particularly challenging, given the high number of munitions involved. We urge both the Coalition and Iraqi forces imediately to end the use of wide area effect and indiscriminate munitions in Mosul, in order to save lives." The groups expressing concern are: Airwars; Amnesty International; Center for Civilians in Conflict (CIVIC); Human Rights First; Human Rights Watch, the International Network on Explosive Weapons (INEW), and War Child.